Today started very unpropitiously. I had trouble getting to sleep as my feet were hurting and I was suffering with some aches and pains in the knees and joints. In particular, my right big toe feels rather peculiar. Fortunately, a dose of Vitamin I sorted them out, however, as I was lying in bed waiting for it to work, I heard the wind change and the rain begin. I thought of all of those ships wrecked on these very shores, near Start Point where I had walked and was thankful to be safe in my bed. I am tempted to change my charity of choice (since I am not doing very well with it anyway) from Guide Dogs to the RNLI. In the morning, the clouds were low, and whilst it was not actually raining, the air was wet. I enjoyed breakfast – the landlord and landlady seemed very friendly after my initial reservations, and there were two other women at breakfast who were interesting to talk to. A discussion of my planned route revealed that the first bit of path would be narrow, precipitous and very greasy under foot after the rain. Bearing in mind my thoughts yesterday rounding Start Point and adding in that I have no head for heights, it all added up to taking a more inland route to East Portlemouth, which I duly did. As I arrived there, and waited for the ferry, the cloud lifted and I could finally see the view. The ferry is a little rowing boat with an outboard motor. It chugged up after a few minutes wait and deposited a boat load of us on the Salcombe shore. 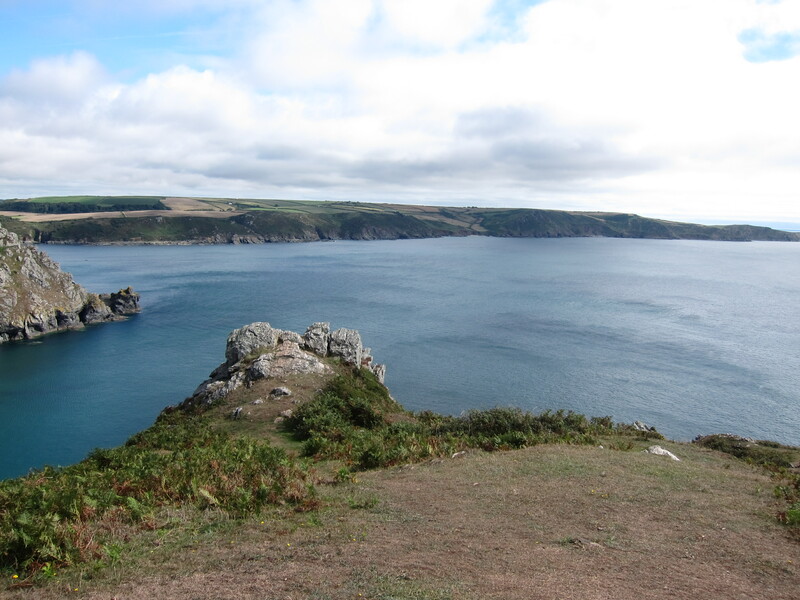 The path twists and twines up to the headland, and I was thrilled to see superb views across to Starehole Bay and Bolt Head. The path is narrow enough, but the sun had come out and dried it up – also, the rock seems to have changed here, and rather than the slippery sandstone, is a much more grippy slate or granite. The next few miles were my second 6 star section (see new grading page in due course). 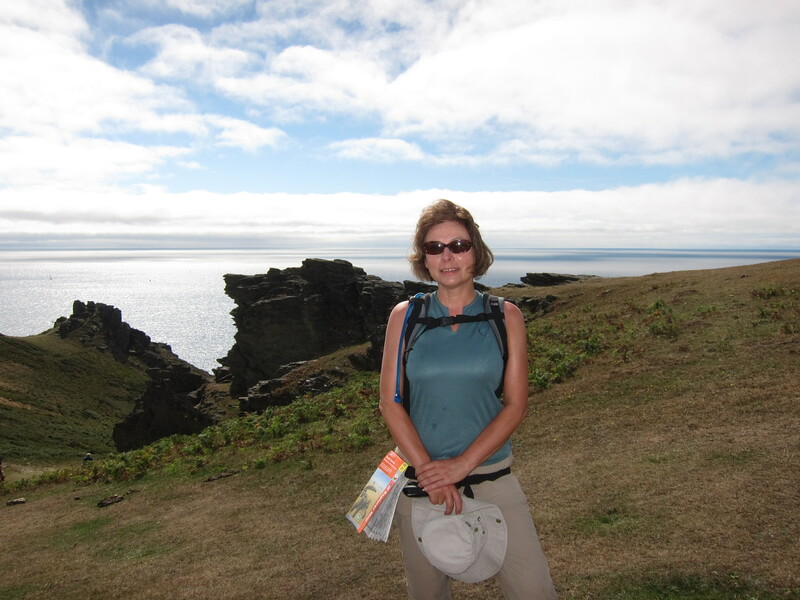 The views were superb, and the walking is my favourite kind – on top of the cliffs with wide views and the breeze on my face. The clouds had more or less cleared and the waters were a deep blue, greenish near the shore with white frills around the many shoals of rock. The path continues like this for some time, then drops down into the truly delightful Soar Mill cove, a golden sandy inlet with a dangerous rock formation at the mouth – it must have been a haven for smugglers as it is almost invisible until you are at the top of it, and there is a path running inland between folds of hills. I could practically see the men of old running a cargo of lace and French brandy. The path then climbs up (very steeply, of course) to Bolberry Down and out to Bolt Tail. 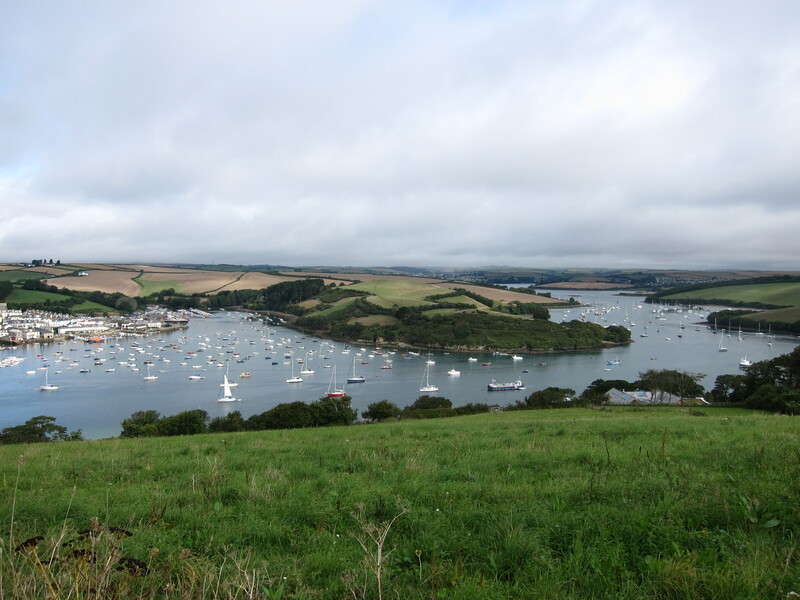 From there, it is possible to see right down past Plymouth Sound and the first headlands of Cornwall. I sat and admired the view for some time, thinking how glad I am to be doing this walk. 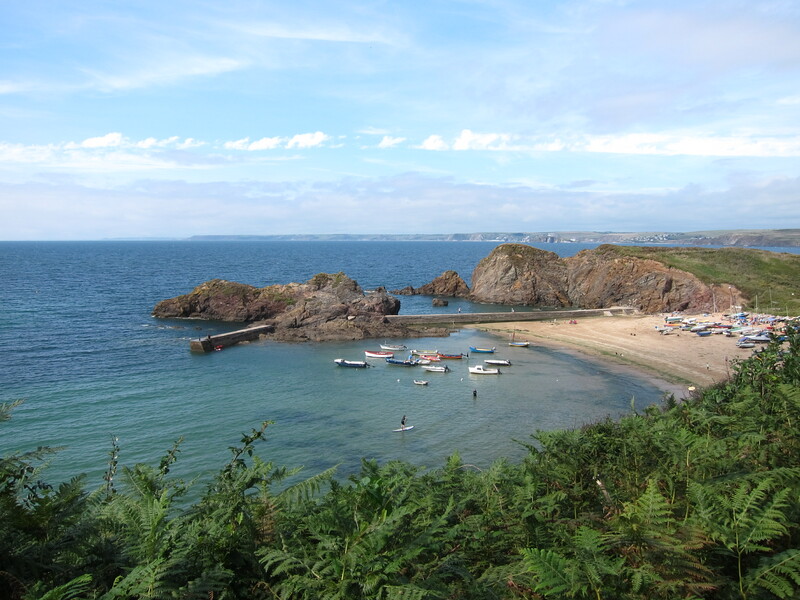 I arrived in Hope Cove around 3pm and decided that this might be my last opportunity for a cream tea. I found a little restaurant and had the best cream tea of the trip so far (see review). I pottered on and then was forced into another inland diversion owing to cliff falls. Unfortunately, this (not stopping for tea!) resulted in me missing the ferry at Bantham. 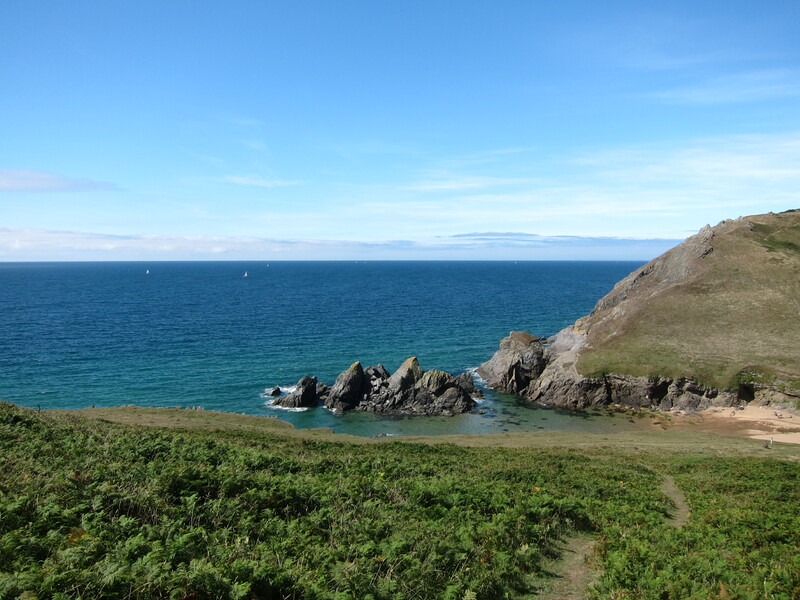 The not-very-informative South West Coast Path website gives the impression that the ferry across to Bigbury-on-Sea runs pretty constantly in Summer. However it doesn’t. Apparently it is only between 10 and 11 and 3 and 4, and even then, only if the guy feels like it. He wasn’t feeling like it today. My choices were an 8 mile detour or a taxi from the pub. Of course, I took the detour! Now, who believes that?